Food Hunter's Guide to Cuisine: Protect Your Hands With The Grill Grip! Protect Your Hands With The Grill Grip! Have you ever reached for the handle of your grill and realize in the most painful way that you not only were grilling your food, but also grilled your hand in the process? This past summer in a rush to make sure my chicken didn’t flame up and burn, I grabbed my grill handle without my glove and cooked my hand to a nice medium rare. A great temperature for steaks but not so much for hands. In the summer in Arizona the grill handle can easily reach 136° or higher. I was delighted to learn a local company had come up with a great solution to avoiding medium rare burnt hands: The GrillGrip. 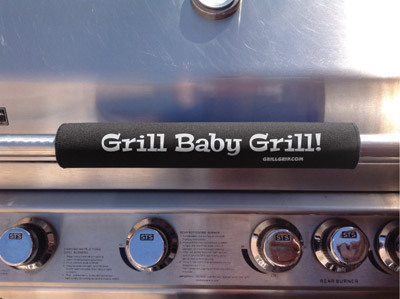 The Grill Grip is a specially designed rubber sleeve that fits securely on the grill handle, and is covered by a durable, washable neoprene cover. It has entertaining slogans that range from “King of the Grill” to the “Grill Next Door.” It can also be customized for the griller that likes to put their personal markings on their grill, or even your company’s logo. It makes a unique groom’s gift for a wedding party or even a wedding gift. I was delighted to see that is came in an array of colors including hot pink for the girls that like to grill like me. Made in the U.S.A. the MSRP of the Grill Grip is $24.95 and is available in a small or large size to fit varying grill handle circumferences. Customizable designs and colors are also available for an MSRP of $29.95. Shipping is free on both products! I can't wait to try a beer can chicken! And anything kabobs! This is a great invention for grilling in AZ! !